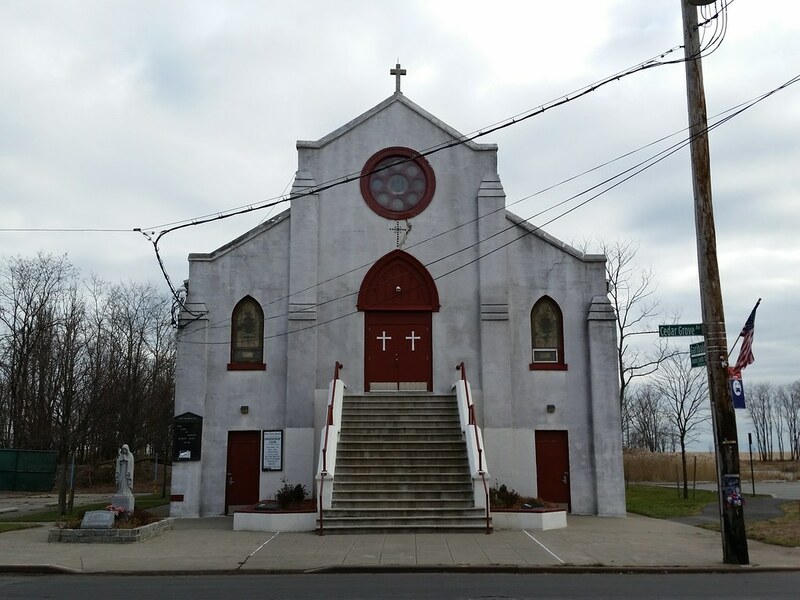 The church was erected here in New Dorp Beach around 1924 to serve the area's bungalow-dwelling population. Between 1958 and 1962, to make way for a shorefront parkway that Robert Moses wanted to build, the city used eminent domain to acquire all the properties in New Dorp Beach east of Cedar Grove Avenue (map). With the exception of the church, all the buildings that stood there — including dozens of bungalows and an old hospital — were demolished, only to have the parkway plan never come to fruition (aerial photos: 1951, 2012). The condemned land is now city parkland, leaving Our Lady of Lourdes in the odd position of having to rent its own building back from the city, and leaving the city in the odd position of owning an active church. Hurricane Sandy's massive storm tide ravaged many nearby houses in New Dorp Beach, but the church's chapel, standing well above street level at the top of the steps, was untouched by the rising waters. The ground floor, however, was ruined, forcing the city-funded senior center located there to close. The center is still shuttered today and will be for some time, but the city now has plans in the works for its reconstruction.